Mobile Device Manager Plus Server should be reachable via public IP address, you can configure the NAT settings in such a way that all the request that are sent to the Public IP address gets redirected to the Mobile Device Manager Plus Server. If you use the same DNS name for both public and private IP, then all internal requests within the LAN will be directed through the internal DNS to reach the private IP without getting routed through the public IP. 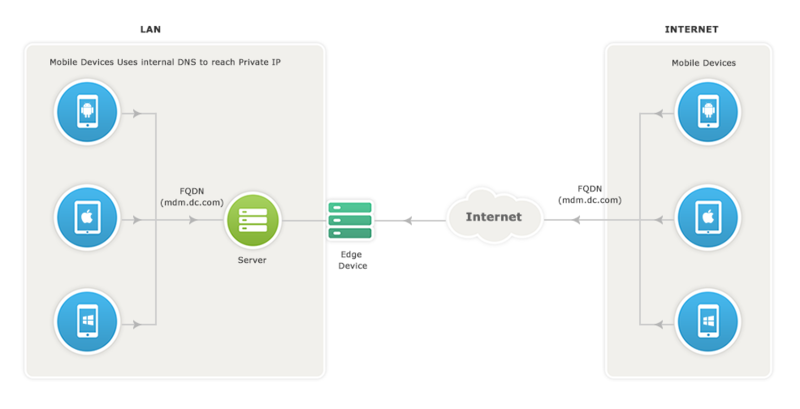 Devices from internet uses the DNS name to reach the public IP address from where it gets directed to the private IP address. It is recommended to use FQDN instead of IP address. You can also use self signed or third party certificates to ensure data security. Since using certificates will encrypt the communication which is the sent to and from the server, this assures that the corporate data is secure in the internet. When you use any third party certificates it recognizes the server using the FQDN. To know more about using third party certificates, refer to this. This section explains you about managing mobile devices without exposing the Mobile Device Manager Plus Server directly to the internet. This can be achieved with the use of a forwarding server. This ensures that the Mobile Device Manager Plus Server is secure from risks and threats from vulnerable attacks. Mobile Device Manager Plus Forwarding server is a component that will be exposed to the internet. This forwarding server acts as an intermediate between the managed mobile devices and the Mobile Device Manager Plus server. Mobile Device Manager Plus server communicates with the APNs/GCM/WNS to wake the mobile device. All communications from the mobile device will be navigated through the forwarding server. When the device tries to contact the Mobile Device Manager Plus server, forwarding server receives all the connections and redirects to the Mobile Device Manager Plus Server. Click NAT Settings under Settings from the left pane. The details of the Mobile Device Manager Plus Server and the ports are pre-filled based on your current setup. You have now successfully set up Mobile Device Manager Plus to manage mobile devices. Once you have the set up ready, to manage iOS devices you have to create APNs certificate and upload it to Mobile Device Manager Plus server. Refer the Port details for iOS, Android and Windows devices. Enter the Mobile Device Manager Plus Server Name, HTTP and HTTPS Port numbers and click Next. HTTPS Port : The port number that the mobile devices use to contact the Mobile Device Manager Plus server (ex:9383 - it is recommended to use the same port 9383(HTTPS) for Mobile Device Manager Plus Server in secured mode). You have successfully copied the certificates, click install to complete the installation process. Ensure that you use “Run As Administrator” and have necessary permissions to install the service. Copyright © 2016, ZOHO Corp. All Rights Reserved.